We need that picture, but with Trump instead. And the Catholic Church officially remains as tone-deaf regarding him as ever. Sigh. Spaceman, I always wanted you to go into space, man!. Holy crap, I had no idea McCandless was that old (ergo, that picture was that old). She was the daughter of Eric Garner, who died in a police chokehold in 2014. She leaves an eight-year-old daughter and a four-month-old son. She was unaware until her recent pregnancy that she had heart problems. Dolores O'Riordan, lead singer of The Cranberries. Paul Bocuse, legendary French chef. Edit: Link replaced by one better suited to explain his significance, as I assume not all readers here will be familiar with the name. Aww. Time to go find more of her stuff and read it. Here's her "Left-Handed Commencement Address." I was momentarily confused on hearing this on the radio this morning, since it sounded like they were announcing the death of an "Ursula Kayler-Guin". We read The Dispossessed in our book club, but I'm pretty sure that was under the name Ursula Le Guin. Did she start using the "K." later in her career? The only book by her I've read was A Wizard of Earthsea and I did not like it. It's also pretty old and it might not have aged well, plus I don't have the nostalgic factor. I should read something else by her at some point. orthogon wrote: I was momentarily confused on hearing this on the radio this morning, since it sounded like they were announcing the death of an "Ursula Kayler-Guin". 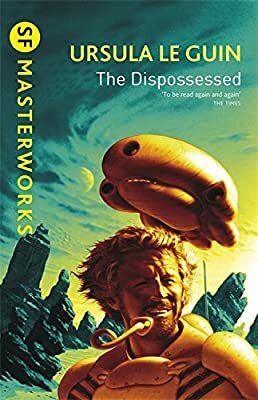 We read The Dispossessed in our book club, but I'm pretty sure that was under the name Ursula Le Guin. Did she start using the "K." later in her career? I can see a 1968 paperback copy of A Wizard of Earthsea up on Ebay that has the "K". As does a 1974 hardcover copy of The Dispossessed. Maybe it depends on publisher or country? Zohar wrote: The only book by her I've read was A Wizard of Earthsea and I did not like it. It's also pretty old and it might not have aged well, plus I don't have the nostalgic factor. I should read something else by her at some point. The Left Hand of Darkness is classic. Location: In midair, traversing laterally over a container of sharks. No water, just sharks, with lasers. It's usually a typesetting issue. She was known well enough by her first and last names that the middle initial (or even middle name entirely) could be dropped and the attribution would still be considered correct. If the letter spacing of the font makes a space tight for an author's name to be placed in a visually appealing way (not crowding out art elements, too close to other text on the cover, etc) then things like middle initials get removed to make room. We're in the traffic-chopper over the XKCD boards where there's been a thread-derailment. A Liquified Godwin spill has evacuated threads in a fourty-post radius of the accident, Lolcats and TVTropes have broken free of their containers. It is believed that the Point has perished. Roger Bannister, first to run a timed sub-4 minute mile, has died at 88. David Ogden Stiers, best known as Major Winchester of M*A*S*H, dies at 75. Winchester was easily my favourite character on M*A*S*H, next to Colonel Potter. Godspeed, sir. This sig for rent. Rates negotiable. This one is a bit late, I know. That's really sad to hear. But he did a lot of good and inspired a lot of people, and way outlived how long the doctors said he'd live. Since his a Brief History of Time introduced me to the concept, I'd have said "Stephen Hawking lost his lifelong battle against entropy today". In recent months, he'd become an increasingly vocal advocate on the NHS, so it's a loss not just to astrophysics and public understanding of science, but to progressive politics too. If you ever thought there was a conspiracy or hidden truths, another believer is gone. People need panic...panic in regular draghts. I read about the governments of the world, and I panic daily. It's a heart pumping workout that keeps my cheeks rosy and my vision crystal clear. I await the conspiracies surrounding his death. The government plays the long game, and planned for old age to kill him? I DIDNT GIVE YOU PERMISSION TO KILL ME YET, YOU CANDY ASSED PANSY! ONLY STEERS AND EMOS WEAR BLACK ROBES AND CARRY KNIVES ON STICKS, AND YOU DONT LOOK LIKE NO STEER SO THAT NARROWS DOWN THE OPTIONS NOW DONT IT!? R Lee Ermy, best known for playing the same scary drill sergeant in every movie he's in, has passed. Harry Anderson, a.k.a. Judge Harry T. Stone (presiding), gone at 65. He founded my local NPR station! Just came here to post carl kassel and see it has been done. Sad days indeed. Barbara Bush has died. Apprently, she and George HW Bush were married 73 years. I can’t pretend as if I knew a lot about her, but it’s still pretty significant. EDIT: Here’s a direct link to her official obituary. The author that made me want to be a contrarian, no new words coming, but what there is will always be cherished.